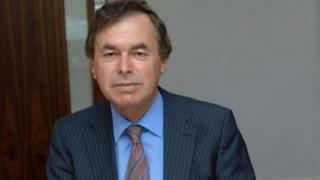 There has been a break-in at the home of the Irish minister for Justice, Alan Shatter, in Dublin. It is believed a man broke into Mr Shatter's home in south Dublin at about 23:30 GMT on Sunday. He entered the house from the back but an alarm went off and he fled on foot. A man in his early 20s was arrested a short distance from the scene. He is being held at Blackrock Garda Station under Section Four of the Criminal Justice Act and can be questioned for up to 24 hours. It is not yet known what, if anything, was taken in the burglary. Mr Shatter is currently in Australia.